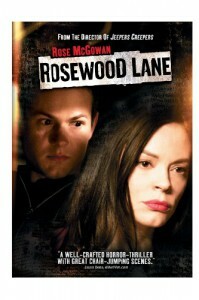 Some years after her alcoholic father dies, Sonny Blake (Rose McGowan), a psychologist with her own radio talk show, moves back into the family home on suburban Rosewood Lane. Her neighbors, she soon discovers, live in fear of the teenage lad who delivers their papers. This kid, Derek Barber, isn't a normal kid. He's not just psychotic, he's probably supernatural. And now he's after Sonny. Whatever possibilities were to be mined from the idea of a kid who holds an entire neighborhood hostage to his own evil, Victor Salva, who wrote and directed Rosewood Lane, tosses out like yesterday's news. All he's interested in is how far it's possible to stretch the viewer's credulity. The story is illogical, the characters are doltish, and it all leads exactly nowhere. Yet I'll bet the trailer's not bad. Out of context, some of the scenes have the edge of a decent thriller. But that pesky script keeps getting in the way. Like when Sonny gets tired of having her house broken into and decides to do something about it, and buys a cat. Meow. Or when she calls the cops and a couple of dolts with badges show up. Or when a major character vanishes and we're supposed to pretend he never existed. You know, like that. Salva has talent, just not writing talent. He also has a criminal record. The Jeepers Creepers director served 15 months of a 3-year sentence after pleading guilty to molesting the 12-year-old star of his 1989 movie Clownhouse -- crimes he evidently filmed. So here's a guy I'm sure many viewers would like to "ban" from their DVD shelves. Here's the problem, though. One, he served his sentence. Two, he claims to be reformed. And three, if you ban him, wouldn't you also have to ban Francis Ford Coppola, who not only helped finance Clownhouse, but who has continued to support Salva and his career ever since? Where's the line? This is why I don't do the ban thing myself. The waters are too murky. Don't think so? Coppola, in Salva's defense, once said, "You have to remember, while this was a tragedy, that the difference in age between Victor and the boy was very small -- Victor was practically a child himself." Salva was 29 at the time. However you manage your viewing, in this case, it will probably work out the same. Rosewood Lane is simply too absurd to rate a look.